Bart's favorite comic-book hero. Born in toxic waste. Defender of Americanism, foe of nonconformists, he became radioactive when caught in a test explosion of the top-secret Mega-Bomb. Says: "Boy did that tank shell sting!" Bart sees Milhouse and Samantha kissing. Homer laments the modern moviegoing experience. Stan Lee helps Comic Book Guy ask out a cute girl. My eyes! The goggles do nothing. 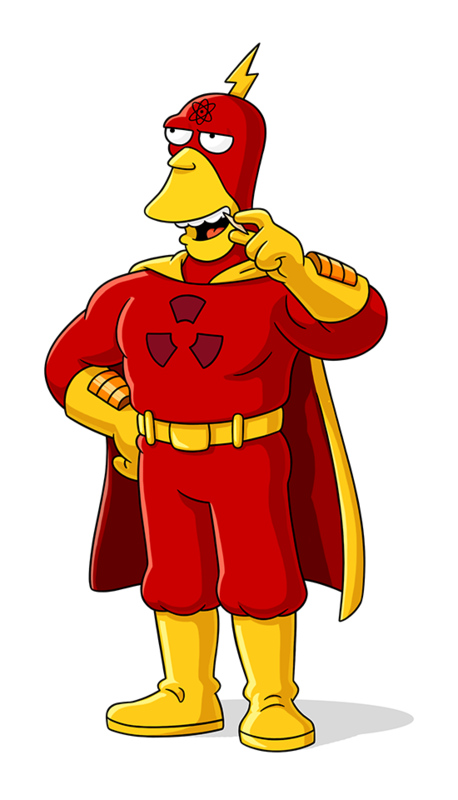 Radioactive Man From S25/E9 - What Happened to Movies?